I love smoked salmon, but what I've discovered fairly recently is that I love it even more when it's cooked. It takes on this lovely texture, turns from a bright, translucent pink to a soft, opaque pink and really adds a quick and easy bit of delicious, flavorful protein to a meal. 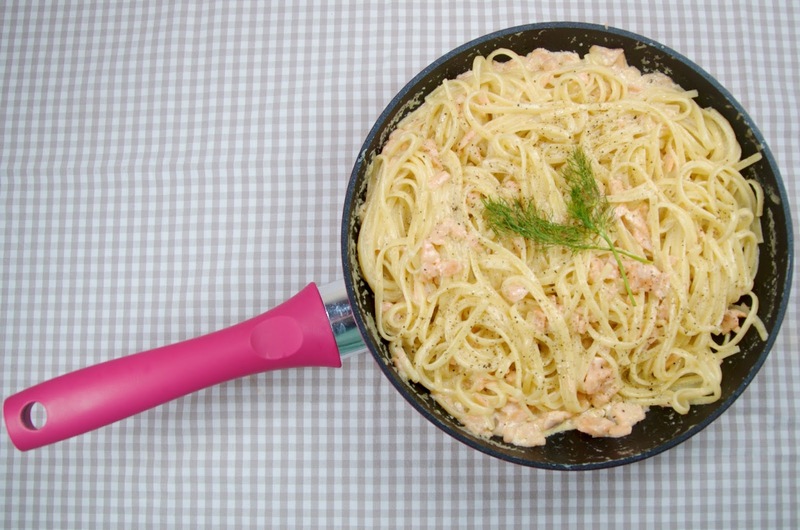 While it doesn't taste too different from cooking regular salmon in a dish, smoked salmon is great because it tends to last in the fridge longer, so you can always keep it handy to add to pasta dishes or scrambled eggs. Know what else I love? A fabulous new bit of cooking kit and my latest obsession is the Kuhn Rikon Colori Cucina Collection, a lovely range of really great, high quality cookware items in hot & fabulous colors! There's nothing like a few lovely new cooking supplies to motivate you to get in the kitchen and make something delicious and when they're hot pink, it's a no-brainer really. These gorgeous pieces are fun enough to use in the kitchen, but they also look lovely if you want to bring them straight to a trivet on the table at serving time. Since they're available in a rainbow of gorgeous hues, you can really add a pop of color to your dinner table. While we're on the theme of pretty-in-pink kitchen gadgets, I also used this gorgeous fuchsia knife from the Kuhn Rikon Colori Knife Collection. 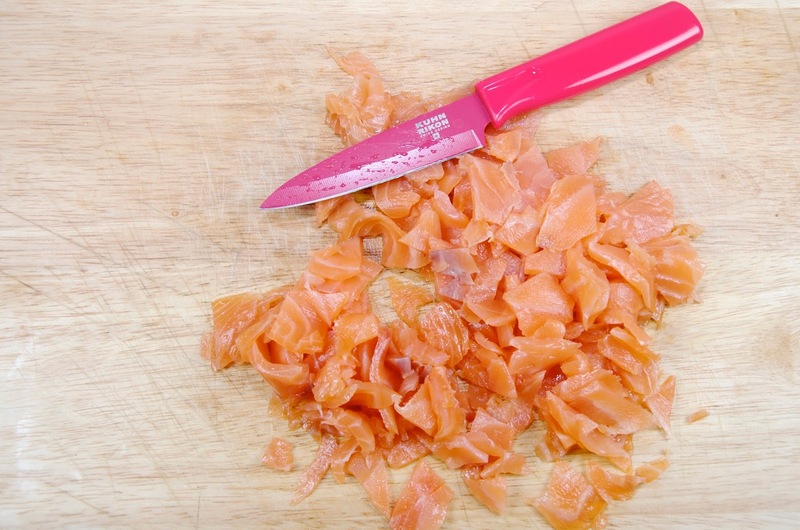 It's the perfect sharp knife to have on hand for easily chopping up smoked salmon, which can be a bit of a chore if you don't have a good quality, super sharp knife. I love having this knife in the drawer now and don't be fooled by it's cuteness... It's really sharp! What's also great about the Colori Pairing Knife is that it comes with a little slide on cover, so there are no worries about chopping off a finger when you reach in the drawer for it. Handy, right? 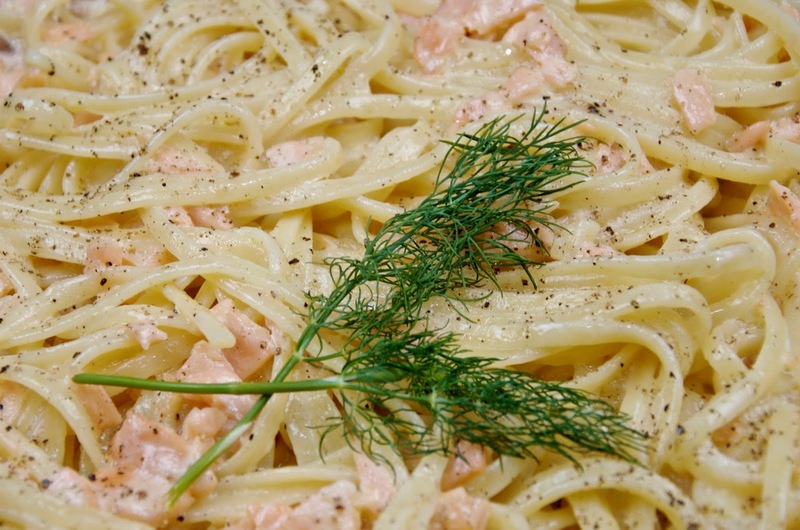 This Linguine With Smoked Salmon recipe is super easy and doesn't take very long to make, so it's the perfect weeknight supper. 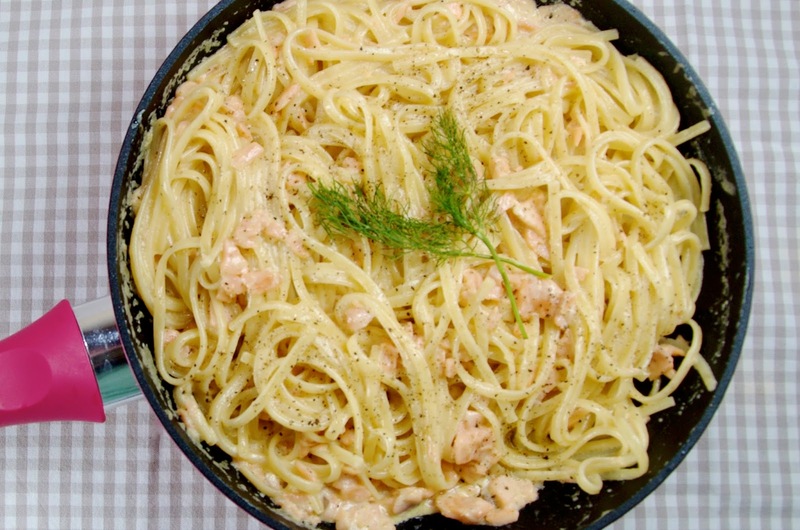 I don't know about you, but I almost always have things like butter, smoked salmon, lemons, pasta and double cream on hand, so I can whip this up on most days with little-to-no-notice, however if I do need any of the ingredients on the list, many of them if not all of them can be found in local late night mini-grocery shops like a Sainsbury's Local or a Little Waitrose, so it's pretty easy to put this on the table anytime and it's always a crowd pleaser! Some similar recipes use whisky, so if you don't have any brandy at home, a whiskey or even a bourbon would probably work just fine, but I love the richness of brandy with the cream. Also, if you like something with a bit of a kick, this dish would be lovely with 1/4 teaspoon of dried chilli flakes sprinkled into the butter & salmon to sizzle a bit just before you add the liquids. However you choose to enjoy this, feel free to experiment with the flavors and enjoy it! 1. Put a large pan of water on to boil for the pasta. Add salt and a drop of olive oil before cooking the pasta according to packet instructions. Strain the pasta, reserving a cup of the starchy pasta cooking liquid and set aside, keeping the linguine warm with the lid on the pan. 2. Meanwhile, melt the butter in a large frying pan over medium-low heat. When the butter is starting to get a bit bubbly, stir in the smoked salmon, double cream and brandy. 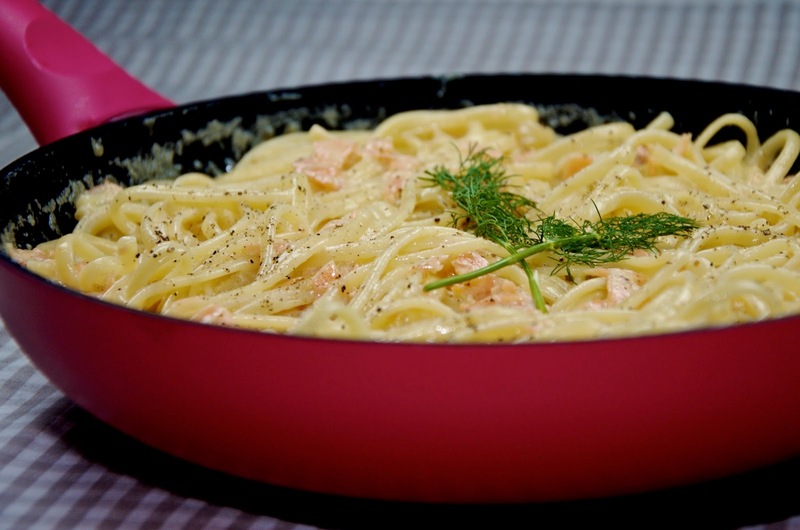 Continue to cook for 2 to 5 minutes until the salmon has lost its raw look and the creamy sauce has thickened slightly. 3. Reduce the heat to low, season the sauce with salt and pepper to taste and finally add the lemon juice 1 tablespoon at a time until you get the tartness you like, stirring with a wooden spoon continuously. 4. Add the cooked pasta to the sauce, tossing until every strand is coated with the sauce. If you find the sauce too thick or dry, add some pasta cooking liquid 1 tablespoon at a time to wet it a bit as you toss. 5. To serve, sprinkle with some chopped, fresh dill and garnish with a sprig if desired. This step is not at all required, but if you have some fresh dill on hand, it really adds to the flavor of the dish and complements the fish nicely. For more information on the Kuhn Rikon products used in this post or to find a stockist near you, visit https://co-uk.kuhnrikon.com/co-uk/en/home.html.